There is always a show, big or small, at the hugely popular Fraze Pavilion, uniquely situated in a park in the middle of a neighborhood. Guests can enjoy fresh air and sunlight in addition to their favorite artists. Those with upcoming shows for the first time at Fraze include Alan Jackson, Little Big Town, Casting Crowns and Il Divo. However, returning to the stage is a name almost everyone recognizes: Ringo Starr. She explains that people are attracted to the pavilion because of its central location and diversity. Every year, Fraze offers something for everyone’s musical tastes and for everyone’s budgets. There are free festivals in the months of June, July and August. “There are fountains and it’s just a beautiful place to see a concert. It’s easy access to the venue. Parking is easy. There are plenty of ways to get in and out of the venue. There are plenty of people who leave the venue and are home in 15-30 minutes,” she explains. 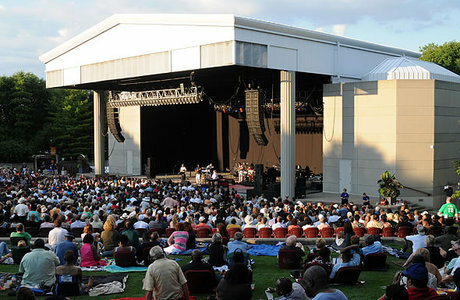 Durahm says the Fraze Pavilion’s summer concert season runs from Memorial Day through Labor Day. However, Fraze is open year round and many people take advantage of the beauty of the park to walk, fish, read a book or enjoy lunch outdoors. She also states that, come wintertime, Lincoln Park is the home of the Mayor’s Christmas Tree Lighting, which is held the first Friday of December featuring music, carriage rides, sweet treats and decorated trees. As far as other big events go, Kettering’s Cultural Arts Manager Shayna McConville says that people won’t want to miss the 26th year of Art on the Commons, a large street festival that celebrates fine arts primarily from local artists but includes artists from around the country. She says that about 100 fine craft artists and artisans participate, and the event is free and accessible to the public. However, the artists who participate sell their work at a wide range of prices. The event is hosted by the Rosewood Arts Centre, which provides plenty of other opportunities for citizens to get involved. McConville says that during the summer, Rosewood’s primary programming is summer camps. There are a number of programs including painting, nature photography, and various types of art, sports, recreation and environmental education camps for kids five through 14. In addition to the Raku firing, there are wheel pottery classes, nature photography and painting, to name a few. There is also a Shakespeare in the Park production in the summer. Rosewood is working with Bespoke Theatre, who will be performing The Tempest. It’s a free production and people are welcome to bring their lawn chairs and a picnic. Rosewood also does a youth festival similar to Art on the Commons called Art on the Playground. The event has a multitude of interactive art activities for kids of any age. They can experience clay, printmaking or painting, all led by professionals. There are theater activities, dance performances and jewelry making. McConville says that kids leave this event with a glow on their faces. Other popular events at Rosewood throughout the year include The View Landscape Exhibition, featuring landscape-themed artwork — conceptually and traditionally — from artists throughout Ohio; Comic Book Studio Day, a partnership with Gem City Comic Con to partner young artists with professional comic book illustrators and writers; and Kettering Children’s Theater, a program that has been going strong for more than 30 years, featuring kids nine to 14 years old working with a professional crew to produce high-quality theater productions every spring and fall. Kettering and Oakwood aren’t the only cities that show residents and visitors a good time. Moraine residents and visitors get their adrenaline pumping in October with a visit to Slash Moraine, which opened at the former Splash Moraine water park in 2008. As one of the Miami Valley’s scariest haunted attractions, Slash Moraine changes up the themes and scenes from year to year, so guests will never know what’s hiding around the corner. Originally written for Cincy Magazine (Dayton Magazine’s KMO Guide).